Sapa tour 2 days 1 night by bus , tourist discovery sapa town by bus from Ha Noi only 5 hours on the High way Noi Bai - Lao cai .You will have a chance to visit a big waterfall on the stream and the old Hydro Electric Power Station built by French people. And Costum of Dzay people at Ta Van . 06h30: Free pick up at your hotel in the Old Quarter of Hanoi and transfer to Sapa. 07h00: Get on big Bus and depart for Sapa ,following Noi Bai - Lao Cai high-way. 12h30: Arrive Sapa Town with colorful traditional costumes of H'mong, Dzao, Tay ethnic People. 14h30: A short trekking to the gate of Cat Cat village which is home of Black H'mong ethnic people and is located near the bottom of a deep valley at the foot of Fansipan Peak. Our local guide will show you the daily life activities of the locals, trek down to the valley bottom to the waterfall where the French built a Hydraulic Power Station; stop for photo with bridge and waterfall then you will walk uphill for bus to pick up to get back to Sapa in the afternoon. 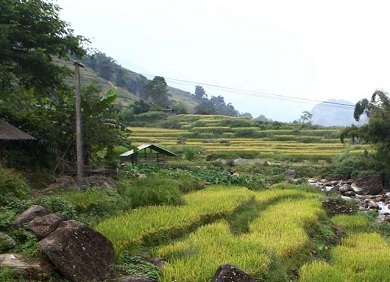 09h30: Trek from Sapa to Y Linh Ho then trek through the rice terraces and along Muong Hoa Stream to the Black Hmong village of Lao Chai to see the spectacular landscape of Hoang Lien Son Mountain. 13h30:Heading to Ta Van village - home of Dzay ethnic people. 14h30: Bus picks you up at Ta Van Bridge to Sapa.